Guitarist Nokie Edwards, who played with the Ventures during a number of periods between 1960 and 2012, died on Monday from an infection he incurred after hip surgery in December. He was 82. Edwards was born in Lahoma, OK into a musical family which had him playing a variety of instruments by the time he was five. They eventually moved to Puyallup, WA and, after finishing school, he did a stint in the military. When he was released, he began playing music in local clubs. In early 1958, Buck Owens moved to Tacoma, WA where he bought a radio station. Edwards played in Owens' band, prior to the Buckaroos, along with being a part of the house band for the local television station, KTNT. Meanwhile, Don Wilson and Bob Bogle had formed the Ventures in Tacoma in the late-50's. In 1960, they saw Edwards playing in a club and decided to bring him on as the band's bass player. They soon found themselves in a studio recording a version of Chet Atkins' "Walk Don't Run". That record, released on the Dolton label, went to number 2 in the U.S. and the album of the same name went to number 11, establishing the group as major album artists along with their radio popularity. The next year, with Nokie's urging, Edwards was moved to the lead guitar spot with the group scoring more hits like "Perfidia" (1960 / #15) and "Walk Don't Run '64" (1964 / #8) along with numerous albums, up to four per year, all making the top 100. 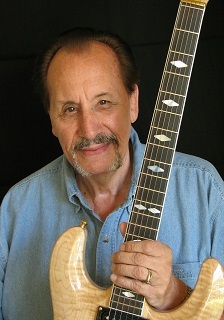 In 1968, Edwards left the band for a solo career with a number of albums before returning to the Ventures from 1973 to 1984 when he left to move to Nashville. He returned one more time but eventually retired to Nashville, making guest appearances with the band through 2012. He also played with a number of other local bands and, in 2010, had a role in the HBO series Deadwood as a mysterious friend of Wild Bill Hickok. Edwards, along with the Ventures, were inducted into the Rock and Roll Hall of Fame in 2008.